For other places with the same name, see Orangeville (disambiguation). "Historic Charm -- Dynamic Future"
Orangeville (UA population 30,734) is a town in south-central Ontario, Canada, and the seat of Dufferin County. Territory of the Petún (Tionontati) people. The archeological record in Dufferin County dates indigenous occupation of the area to the "early Paleo-Indian" time period from 9000 to 8400 BCE. 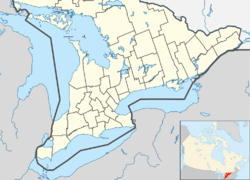 What eventually became Orangeville and Dufferin County, was historically the traditional territory of the Tionontati or Petún (Tobaco) People. "The Petun occupied from eight to ten villages located below the Niagara Escarpment along the southwest margin of Georgian Bay". Although described in the Encyclopædia Britannica as "living in the mountains south of Nottawasaga Bay, in what are now Grey and Simcoe counties", according to Sawden's "A History of Dufferin County" the Petún also lived farther south at the source of the Grand River in Dufferin County. After the decimation and dispersal of the Huron, Petún, and Neutral people of southern Ontario, Algonkian peoples from northern Ontario moved into the area at the end of the 17th century and the beginning of the 18th century, while members of the Three Fires Confederacy (Chippewa, Odawa, Potawatomi) moved into southern Ontario from Ohio and Michigan in the late 1700s. During the pre-confederation Treaty era, Anishinaabe or Chippewa First Nations signed Treaty #18 on Oct 17th, 1818, which included the Dufferin County area. [b] Today, the descendants of Petún call themselves Wyandotte, and despite the 350 years since their displacement from southern Ontario, and despite the heteroglot and diasporic nature of their contemporary communities (located in Oklahoma, Michigan, Kansas, and Quebec), they continue to recognize their shared history and are united through a modern-day Wyandotte Confederacy. The house of Orangeville founder Orange Lawrence as it stands today. The first patent of land was issued to Ezekiel Robinson, a land surveyor, on August 7, 1820. That was followed by land issued to Alan Robinet in 1822. In 1863, Orangeville was named after Orange Lawrence, a businessman born in Connecticut in 1796 who owned several mills in the village. As a young man, he moved to Canada and settled in Halton County. During Mackenzie's rebellion in 1837, he was a captain in the militia. Lawrence purchased the land that became Orangeville from Robert Hughson. Orange Lawrence committed suicide December 15, 1861. In 1873, the Act of Incorporation was passed and Orangeville was given town status on January 1, 1874. The public library, located at Broadway and Mill Street, was completed in 1908. Andrew Carnegie, well-known businessman and philanthropist, provided financial assistance for its construction. There are a number of manufacturing plants located in the town. Major industrial employers include Greening Donald (automotive airbag components), Resolve Corporation (computer outsourcing), Clorox Company of Canada (Glad garbage bags), Relizon Canada (pressure-sensitive labels), Rochling Engineering Plastics (formerly Symplastics Limited) (plastic sheets) and Sanoh Canada (automotive components). Orangeville is also the main banking center for residents in the area. The main intersection in the heart of the town is Broadway (formerly Ontario Highway 9) and First Street. Highway 10 runs through Orangeville on its east side. Beginning in 2005, a major roadwork project was initiated to resurface Broadway through Orangeville. The downtown section was completed in early 2006, with extensive work still to be done on the west end in late 2006. In conjunction with this project, there was another one completed in late 2006 that involved building large planters in the middle of Broadway through the downtown section between First and Third Streets (West - East). The project was controversial, as safety concerns had been raised by the Fire Department because the new concrete planters in the middle of the road have made the rights of way too narrow for fire trucks to properly set up in case of a fire in a downtown building. Construction of the South Arterial Road, often referred to as the 'Orangeville by-pass', was completed on August 3, 2005. The road runs from east to west, connecting Highway 10 and County Road 109 (formerly Highway 9). Much of the eastern stretch runs through the Town of Caledon, but officially enters into Orangeville at the Townline Road controlled intersection. Aecon Construction and Materials Limited was the successful bidder for the Design Build project with a price of $9.8 million. The project was completed in conjunction with Brampton-based Armbro Construction, TSH Engineers Architects Planners, Peto MacCallum Ltd. and Gartner Lee Ltd.
Orangeville Transit is the town's own public transit system, and there is a commuter GO Transit bus service to Brampton. In the early 1990s, preliminary plans were drawn up for GO Transit rail service to Orangeville. However, it never got past the drawing board. Industries in Orangeville are served by the Orangeville Brampton Railway, which purchased 55 kilometres (34 mi) of surplus track from the Canadian Pacific Railway. The railway connects with the CPR in Streetsville, and also services customers in Brampton to the south. A tourist train is operated on weekends in summer months. In 1906, survey work was underway for an electric railway line which would serve Orangeville, to be called the Huron and Ontario Electric Railway. According to the 2016 Canadian Census, the population of Orangeville is 28,900, a 3.3% increase from 2011, with a 0.65% per annum average growth rate over the same period. The area is 15.61 km2 (6.03 sq mi), giving a population density of 1,900/km2 (4,900/sq mi). The median age is 38.8 years, lower than the national median age of 41.2 years. There are 10,696 private dwellings with an occupancy rate of 98.8%. According to the 2015 National Household Survey, the median value of a dwelling in Orangeville is $400,320, higher than the national average at $341,556. The median household income (after-taxes) in Orangeville is $73,605, higher than the national median of $61,348. Upper Grand District School Board operates secular anglophone public schools. The Dufferin-Peel Catholic District School Board operates anglophone catholic public schools. The Conseil scolaire Viamonde operates secular francophone schools serving the area. The Conseil scolaire de district catholique Centre-Sud operates catholic francophone schools serving the area. There are currently eleven public and separate elementary schools in Orangeville: Credit Meadows, Mono Amaranth, Montgomery Village, Parkinson Centennial, Princess Elizabeth, Princess Margaret, St. Andrew's RC, St. Benedict's RC, St. Peter's RC, Island Lake Public School and Spencer Avenue Elementary, as well as a holding school, formerly Springbrook Elementary. Along with these publicly funded schools, there are several private schools in the area: Headwater Hills Montessori School, Dufferin Area Christian School, Hillcrest Private School, The Maples Independent Country School, Orangeville Christian School. A French elementary school named L'École élémentaire de Quatre-rivièrs (translated as "Four Rivers Elementary School") currently resides in the old Springbrook Elementary building despite the reason for closing the school being 'structural' problems. Most of these problems are said to be the result of 'improper foundation for the area' as the school was built upon a swamp. [d] It is currently being used as a holding school that other schools including Island Lake, Montgomery Village, and Princess Margaret, have used while repairs, renovations, rebuilds and construction were completed. There are two secondary schools within the boundaries of Orangeville: Westside Secondary School and Orangeville District Secondary School (ODSS). A catholic secondary school Robert F. Hall Catholic Secondary School draws around 1000 students from Orangeville and the rest of the county despite being within the Region of Peel. Humber College is scheduled to offer full-time programs in Fall 2007 at a temporary location at the Alder Street arena. A new campus was planned on an 11-hectare (28-acre) site located on Veteran's Way. The first phase of the new facility is planned to open in late fall 2007 or early 2008. Upon opening, the campus is expected to accommodate up to 400 students, expanding to 2,000 by 2017. As of July 2016, Humber is still run out of Alder Street arena. Georgian College currently owns and operates a campus offering full & part-time courses located at 22 Centennial Road. It is also delivering Employment programs and services out of a location on 51 Townline. Statue of Santa Claus in Kay Cee Gardens, other wooden statues can be seen throughout the town. Orangeville hosts the annual Orangeville Blues & Jazz Festival. The Town Hall building contains the historic Orangeville Opera House. This facility is the home base of professional theatre company Theatre Orangeville, and hosts plays and concerts throughout the year. The Orangeville Flyers were a junior 'A' ice hockey team and part of the Ontario Junior Hockey League. They played home games at the Alder Street Recreation Facility until moving to Brampton in 2018. Orangeville was also home to a professional basketball team, the Orangeville A's of the National Basketball League of Canada, who played at the Orangeville Athlete Institute. The Athlete Institute Academy is home to Orangeville Prep, which has produced two top-10 NBA draft picks. The Orangeville Northmen junior A and B box lacrosse teams are based in Orangeville. There are two local newspapers based in Orangeville, the Orangeville Citizen and the Orangeville Banner. Until June 2005, Rogers Television maintained its Peel North studio and production facility at 98 C-Line. The facility was closed to allow for expansion of the Peel North headend. Rogers is the cable provider for Orangeville. In July, 2014, the CRTC approved an application by My Broadcasting for a broadcasting licence to operate an English-language commercial FM radio station in Orangeville. The new station will provide Orangeville and its residents with a dedicated local radio service that will fulfill specific requirements relating to local Orangeville programming, including the broadcast of announcements that are reflective of its standing as a community distinct and separate from Toronto. Orangeville is located in provincial electoral district of Dufferin—Caledon. This was changed from Dufferin—Peel—Wellington—Grey when the Province instituted the 107 electoral districts revision in 2006. Its current Member of Provincial Parliament is Sylvia Jones, former assistant to Progressive Conservative Party of Ontario leader, John Tory. Federally, Orangeville is located in the Dufferin—Caledon electoral district. Its elected Member of Parliament is currently David Tilson of the Conservative Party. On November 4, 2015, The Canadian Institute of Planners announced winners of its fifth annual Great Places in Canada contest. A jury of seven professional planners named Broadway as the Great Street. "The jury was impressed by the central role Broadway plays in the Orangeville community, along with the heritage character and streetscape design." ^ The Iroquois would also have been affected by population decline from European diseases, and that they were known for adopting large numbers of captives from rival nations to become members of their own society. This would have compensated for the loss of life in their own communities and bolstered their own population, so many of the Petún likely became assimilated into Iroquois Nations. ^ Similarly, other areas of southern Ontario that were once the traditional territory of the Huron and Neutral, also became part of Treaties signed by Chippewa groups. ^ Because of this the intermediate (grade 7-8) yard area is known to gain a large pond in the spring, about 1 1⁄2 feet (45.7 cm) deep at the deepest point. This pond is referred to as Springbrook Lake by students and staff. A second smaller pond, only about 1 foot (30.5 cm) at its very deepest, appears in the primary (grades 1-3) yard. This is referred to as Springbrook Pond. ^ "Orangeville, Ontario (Code 3522014) census profile". 2011 Census of Population. Statistics Canada. Retrieved 2012-08-14. ^ "Orangeville (Population Centre), Ontario (Code 0609) census profile". 2011 Census of Population. Statistics Canada. Retrieved 2012-08-14. ^ a b c d "Orangeville, Ontario (Code 3522014) census profile". 2016 Census of Population. Statistics Canada. Retrieved 2018-01-28. ^ a b "Orangeville (Population Centre), Ontario (Code 0609) census profile". 2016 Census of Population. Statistics Canada. Retrieved 2018-01-28. ^ Canadian Climate Normals 1971-2000, Environment Canada. Retrieved May 19, 2012. ^ Zigomanis, Halo. "Stage 2 Archaeological Assessment - Grand Valley Wind Farms" (PDF). Retrieved January 3, 2014. ^ a b Ramsden, Peter G. "Petun". The Canadian Encyclopedia. Retrieved December 29, 2013. ^ "Tionontati". Encyclopædia Britannica. Retrieved December 29, 2013. ^ Sawden, Stephen (1952). History of Dufferin County. p. 7. ^ Sultzman, Lee. "TIONONTATI HISTORY". Retrieved December 29, 2013. ^ "The Tionontatehronnon (Petun)". Retrieved December 29, 2013. ^ Campbell, Candice. "Cultural Aspects of Warfare: The Iroquois Institusion of the Mourning War" (PDF). Retrieved 18 November 2018. ^ Zigomanis, Hali. "Stage 2 Archaeological Assessment - Grand Valley Wind Farms" (PDF). Retrieved January 3, 2014. ^ "Stage 1 Archaeology Assessment - Summerhaven Wind Energy Centre" (PDF). Retrieved January 3, 2013. ^ "Wyandotte Nation". Retrieved January 5, 2013. ^ "Nations of the Wyandotte". Retrieved December 5, 2014. ^ "Orange Lawrence". geni.com. Retrieved 18 November 2018. ^ "Former residents of Orange Lawrence's historic home learn how he died 156 years later". orangeville.com. Retrieved 16 December 2018. ^ "Certificates and Notices Under the Construction Lien Act". Daily Commercial News and Construction Record. Reed Business Information a division of Reed Elsevier Inc. September 2, 2005. Archived from the original on 28 July 2011. Retrieved 18 November 2018. ^ "Dipping Into the Past - Survey under way for electric railway across Dufferin". Orangeville Citizen. November 23, 2006. Archived from the original on 3 February 2009. Retrieved 18 November 2018. ^ a b "Census Profile, 2016 Census: Canada". Statistics Canada. Retrieved 2018-01-29. ^ "Tree Sculptures Offer Unique Look at Orangeville". Orangeville Banner. May 30, 2018. ^ "Orangeville". Canadian Climate Normals 1981−2010. Environment Canada. Retrieved 2016-05-12. ^ "And the Winners of Great Places in Canada are..." Canadian Institute of Planners. Archived from the original on November 11, 2015. Wikimedia Commons has media related to Orangeville, Ontario. Wikivoyage has a travel guide for Orangeville (Ontario). This page was last edited on 30 January 2019, at 15:51 (UTC).